I've very selective when it comes to what I watch on Youtube. When I was younger I enjoyed watching a lot more unrealistic Youtubers but now I only like watching people who inspire me and K-pop videos. Today I'm sharing my favorite channels that inspire me whether that me visually or to chase my artistic dreams. I love to watch illustrators, freelancers, small businesses because that's the type of lifestyle I want so these ladies really inspire me to chase after my dreams. My biggest inspirational is Rainbowholic, aka Kaila. 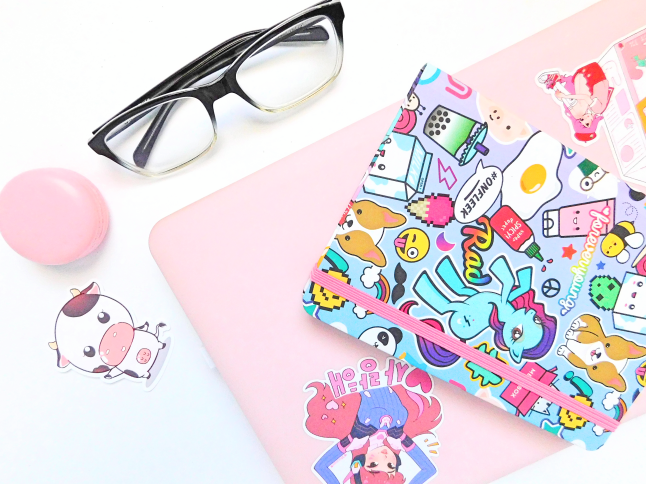 She was the one who got me into kawaii journaling. Most of her videos are on stationery but she also sometimes posts travel vlogs and her life in Japan. Watching her dreams come true in the past year is very rewarding and inspires me to chase my dreams. I discovered Ellis on Twitter because a fellow blogger who I followed mentioned her art and soon become a fan of her art. She shares the ups and downs of running an indie business. Her studio vlogs are really interesting. I love watching her come up with new designs for her shop. Found Fran through Ellis's videos. I actually followed Fran on Instagram for a while but I just recently got into her videos. Her channel is mainly about art and being an illustrator and she posts weekly vlogs regularly. When I was younger I wanted really into drawing and wanted to be an artist so watching her videos is really comforting to watch because it's like seeing the life of an artist. Studio vlogs are my favorite type of Youtube videos to watch. My favorite studio vlogs are by Catherine aka Katnipp. Her studio vlogs were always advertised to me but the first video I saw of her's was a DisneyWorld Vlog. After watching her DisneyWorld/Florida vlogs I decided to watch her studio vlogs and she's so inspirational! She runs an Etsy shop in her pastel wonderland of a studio. It always amazes me how much she can do in her videos. Whenever I need some motivation I watch one of her studio vlogs. Sara's videos were also always popping up in my recommendations section and finally decided to give one of her studio vlogs a watch, her personality is very calming which translates to her videos. Her art style is more neutral and different from the illustrators that I've mentioned above but I can appreciate that style. Lastly, is the channel, Sueddu. She is a freelancer living in South Korea. All of her videos have English translations so those who don't understand Korean can easily watch. The videography in her videos is visually pleasing, she can make the simplest task look astounding! I highly recommend her videos if you want something relaxing to watch. Who do you enjoy watching on Youtube? I watch Ellis Woolley and Frannerd too. Their channels are great! You have literally listed ALL my go-to channels! I'm a patreon for Ellis too and she does the most magical behind-the-scenes content <3 I recently begun studio vlogging myself as i was so taken by the style of their videos, it's so calming to watch and the world NEEDS more creativity!